When Toyota designed the first generation (AW11) MR2, they set out to make it an affordable, fun, economical sports car that was practical and comfortable enough to use every day. While Toyota’s engineers did a lot of things right, one thing that they really got wrong was the amount of shock travel in the front struts. Even at stock height, the bump stops take a beating, and if you lower the car at all, you quickly run out of travel completely. My car was lowered only an inch or two, and I was left with maybe 2 inches of travel. The problem is that the housings are just too darn long. I happened to have a spare set of front housings from a 1991 MR2 (SW20) and had heard of people making them work, so I figured I’d give it a shot. Check out the original article on the JCVA website! The objective was to make these housings work with my existing Ground Control/T3 coilover setup and bolt right up to the stock spindle, while maintaining sway bar geometry and stock camber adjustability. The first step was to remove the stock spring seat, since we won’t be using those. 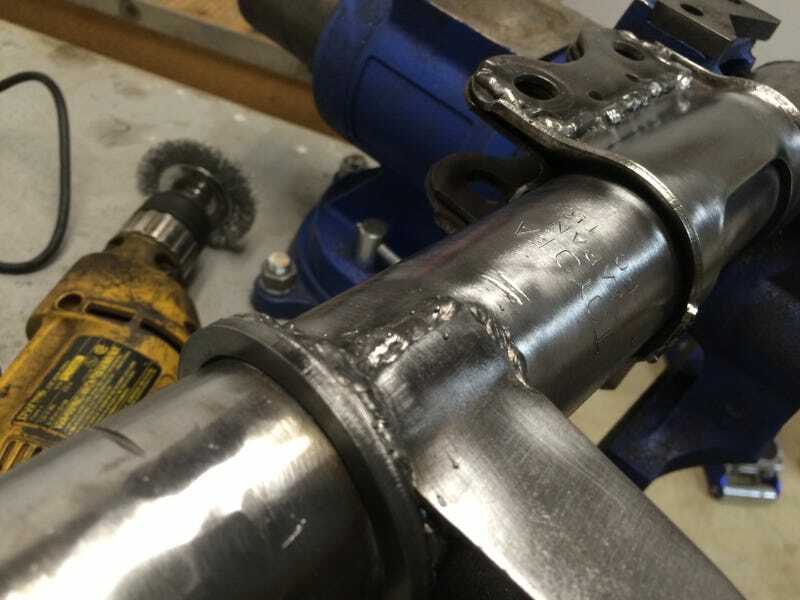 The next step is to grind the welds down flat so the sleeve will fit around the housing. A flap disc on an angle grinder makes short work of these. The next thing to tackle is the sway bar brackets. The flange where the sway bar attaches sits at an angle. However, due to the direction of the angle relative to the brake line tab, these will need to be reversed to match the orientation on the AW11. So you will be using the RH housing on the left side of the car, with the sway bar brackets swapped between them so that the angle and brake line tab are pointed in the correct direction. Simply remove the brackets by cutting away at the weld. Be careful not to damage the bracket itself, since you will be reusing them. Here is the housing with the new coilover sleeve seat (from T3) and sway bar bracket welded on. To position them, I measured the distance from the top of the “clamp” – the part that bolts the strut to the spindle – to match the position of the bracket and coilover seat from the AW struts, thus keeping the geometry the same. On this side you can see a little bonus that nobody on the forums seem to have addressed yet at the time of this writing. The bolt holes on the clamp are much larger on the SW housing, so if you were to just bolt it up, there would be a ton of play. I took a layer of metal from the clamp on a spare AW strut I had laying around and welded it over one side, giving the smaller AW bolts a good home. Luckily the larger SW holes are the same size as the larger slotted upper hole from the AW part, allowing full use of the factory camber adjustment cam with no looseness. Next step was to clean the whole thing to get it ready for painting. Notice the extra welding we put on the underside of the sway bar bracket. A little extra strength never hurt anybody. My hyper-sophisticated painting booth, AKA, hanging by a chain from the rafters in my garage. I used the same Duplicolor Wheel Enamel that I’ve used on all my past DIY coilover projects. Here’s the finished SW housing next to a stock AW housing. The new housings will give me around 1 1/8″ of extra shock travel. You will notice here that the width inside the clamp where the spindle bolts in is a bit wider on the SW part. I was able to find washers that took up the extra space perfectly, so play in that area shouldn’t be an issue either. I had to trim a little bit of the threaded sleeve to clear the gland nut, but I still have a decent range of adjustment on there. You can see how much less tube extends beyond the sleeve seat, freeing up more room for the shock to move. Here’s an SW front shock insert next to an AW housing. The SW part is not only shorter, but a larger diameter as well. Here it is all assembled. Unfortunately I had put the wrong bump stop on, so I had to replace that with one of the slightly thinner ones I had laying around. I was so excited to install them at this point, but I wasn’t anticipating the issues I would soon encounter. Old cars are always an adventure to work on. When I went to zero my camber plates in preparation of getting an alignment, I wound up snapping several bolts. I’ve had these plates since spring of 2009, and they have endured seven years of daily driving in the heat of the summer and salty winters, innumerable autocross days, and several circuit events as well. I also discovered that one of the big bearings was worn and loose as well. After dealing with TechnoToyTuning for the last 7 years on multiple projects (I have their rear camber plates on the MR2, as well as a ton of their parts on my Cressida wagon), I knew Gabe would be able to help me out. In the last 7 years, T3 has redesigned their plates and the new ones (which Gabe graciously sent me for a fantastic price) have several improvements to the old design. The first thing is that the new parts have four bolts rather than 3 studs. This means the new plates will fit both the early 3-bolt and later 4-bolt MR2 strut tops. Another added feature is the fact that the bolt holes are slotted, allowing for caster adjustment as well. The last improvement is where the upper spring seat contacts the underside of the plate itself. The old design was flat, not allowing for much change in angle of the strut, causing some interference and rubbing over time as you can see. The new part has a raised edge that perfectly matches the bearing surface on T3’s upper hat bearings (pictured below). This should allow for less binding and smoother steering feel, something AW11 drivers will certainly appreciate, given the lack of power steering. You can see how the new plate design will interface with the bearing hats in a much improved manner. I’ve only had a chance to drive the car around the block a few times so far, but the overall feel is pretty much the same as it was before plus a bit more comfort. This conversion will really shine under hard use, like autocrossing with sticky tires on a bumpy surface like VMP, or during daily driving over bumpy roads where the stock struts tended to bottom out. I can’t wait to get the car aligned and test these out at the track! While the car was down and I was waiting on parts, I also took the opportunity to get rid of some play in my steering column. It was very slight, but I found it to be noticeable enough to do something about it, especially with the added steering effort from the Quaife quick-ratio rack. First thing to do is remove the steering column. Much swearing and sweating was required to get this far. While the column was out I tore into it a bit just to get the markings off the upper bearing in case that ever needed to be replaced. Looks like NSK B18Z-1B1. Here’s the offending joint. It’s down at the bottom where the splined shaft for the u-joint is pressed into the main column. There is a little tiny layer of rubber inside there, and over time it wears out, allowing for some play. Just run a tiny bead of weld on each side and the play is no more.